As you know, I am posting the books that I read each month for two reasons. Number one- it might just help if anyone is looking for something for their next summer reading! Number two- it holds me accountable to my goal. Almost a year ago, I set the goal of reading three books per month. I seriously had a stack that was getting out of control. I would read book reviews or hear about books that I wanted to read, order them, and never read them. There have not been many months that I met my goal, but reading something is better than reading nothing. My husband reads- a lot. I wrote a post recently about our kids and the summer reading program at the library. Some times it is nice to turn all screens off and say we are going to spend some time reading now! 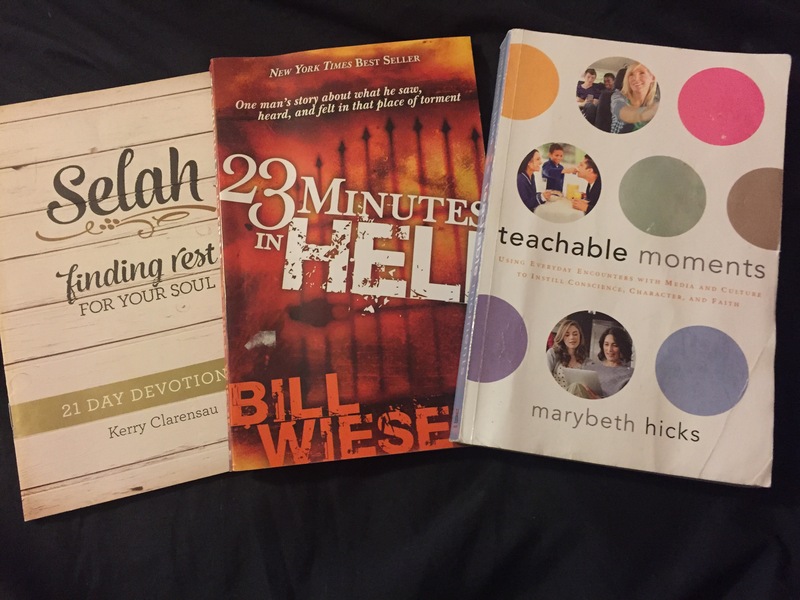 This month I have three books pictured, but I really consider this to be a two book month. The third item was a short devotional. Teachable moments was a wonderful book that was full of personal stories from the author and things that she faced while raising her kids. She would teach you concepts, tell her story and then show examples of how to use moments in life to teach your kids. I liked the fact that she reminded the reader how to flip those sometimes painful situations into lessons on integrity and character. 23 Minutes in Hell is a book that I had read once before, but it has been several years. I decided to read it again and make any notes from it and then pass it on. This book tells the personal story of a man that visited hell. The author researched scripture after his experience and gives scripture references to back up everything that he went through. This would be a great resource for any teacher or leader that might be having a series on hell. Also, it’s a interesting read for anyone at all that is just curious. If you grew up in church, you learn about hell and think that you know all that you need to know. Fire, torment, heat…. Got it covered. This book can just show you how much more is mentioned in scripture that you probably just read right over. The Selah devotion was a refreshing addition to my daily reading. It includes quick devotions that spoke to my heart many days.